Providing world class customer service to West Michigan for over 70 years! This award was given for Brand Loyalty in the MFP Office Copier category to Konica Minolta against 822 brands in 90 categories! Noordyk is proud to offer Konica Minolta MFPs to our customers! A huge benefit of working with Noordyk Business Equipment is their Insight Application that was installed on our equipment. We have been expanding our business and have busy schedules, so the automatic supplies that come when we need them are extremely helpful. Knowing that we always have toner for our equipment when we need it allows us to focus more of our time & energy into our business. I give Noordyk’s a 5 star rating – their customer service is extremely pleasant, helpful and knowledgeable and their service technicians stop in to make sure our equipment is always running smoothly. We have been a happy customer of Noordyk Business Equipment’s for decades. They provide us with good quality service and are always responsive to our specific needs. We’ve done our homework and price checked their proposals – they provide us with fair, affordable pricing for their products and services. We greatly appreciate Noordyk’s willingness to work with our staff to avoid scheduling conflicts when it comes time to service. Noordyk Business Equipment makes it easy and enjoyable to work with them! We previously managed our office equipment ourselves. We were spending a fortune on ink - for low quality machines that we were having to replace much too often. Since making the decision to sign on with Noordyk Business Equipment, they have provided us with quality equipment that consistently produces good quality prints. It is clear that the staff at Noordyk’s has our best interest in mind. They have made recommendations for us that have resulted in improved quality of life in our office. They genuinely care about our needs and always follow up to ensure we are satisfied with their products and service. Overall, they are a great company to do business with. 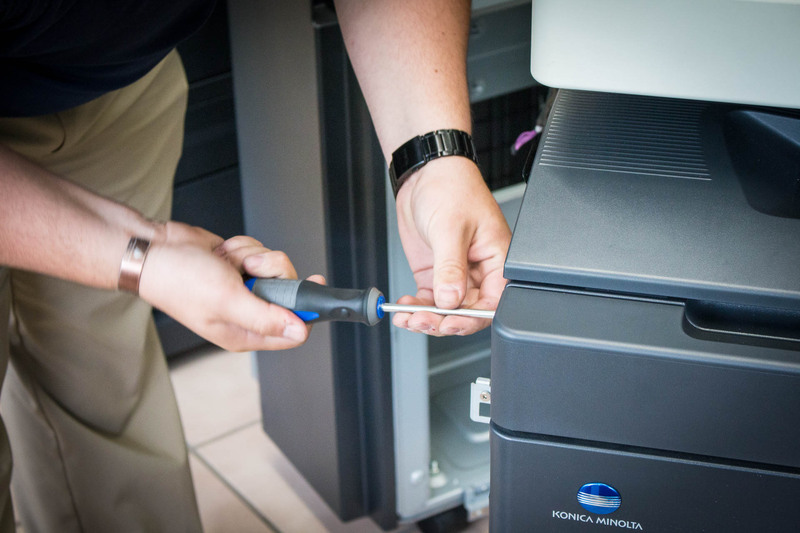 Before partnering with Noordyk Business Equipment, we managed our office equipment ourselves – keeping track of which toner cartridge went with which machine & troubleshooting printer issues via user manuals. Noordyk’s has since helped us by providing well-trained, knowledgeable and friendly staff who ship us supplies when needed and service our machines. Aimee, our account representative, has worked closely with us to evaluate our specific needs ensuring our costs are manageable and reflect our actual usage, so that we aren’t paying for services or supplies that we don’t need or use. Partnering with Noordyk Business Equipment to take over the maintenance of our office equipment has been a great experience. They are helpful and accommodating when it comes to our needs. Our Account Representative, Aimee Paulson, has personally dropped off supplies when we needed them urgently. The finishing equipment that we have from Noordyk Business Equipment has elevated the look of our marketing materials, we are very pleased with the final products. It has been a very pleasant experience working with Noordyk. We happily recommend them to other businesses! We have a folding machine, a laminating machine & a large paper cutter that we purchased from Noordyk Business Equipment. We save so much time by using our folder for our weekly bulletins & other documents that we publish in large quantities – it would take hours to fold them by hand. It is great to know that we can count on Noordyk to be responsive to our needs, they call back right away & if there is a service issue, they are there immediately to fix it. Noordyk Business Equipment has gone above and beyond with the service they provide for our office equipment. Prior to purchasing new equipment from Noordyk our machine was constantly broken, we felt as if we were imposing when asking for service and we weren’t given any other options. Now, Noordyk gives us great customer service. Matt, who services our equipment, happily tackles anything we throw his way. Aimee, our account representative with Noordyk, is great to work with – always attentive to our needs! 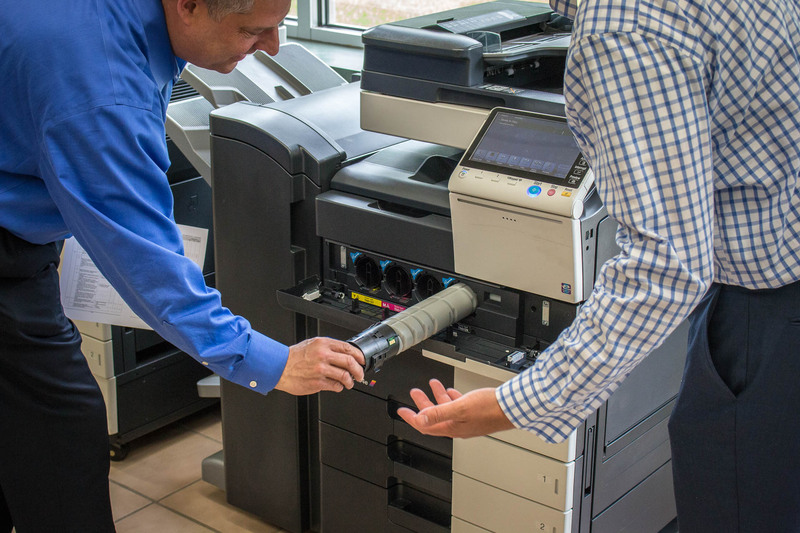 We were not happy with our previous vendor for our office equipment— our machine was slow, jammed frequently, had issues scanning, the print quality was poor—and service calls typically didn’t result in the issues getting fixed. Noordyk Business Equipment has made us much happier! The set up was simple, the quality, speed & functionality of both our copier & desk printers is much better. Any questions we have had have been addressed quickly & in person when necessary. We really love that Noordyk is a local company as well! I felt listened to and included in the process of deciding on a new machine that would work for all the printing needs I have as a legal assistant. The printer I have from Noordyk Business Equipment is much better suited to the needs of my role in the office. I really appreciate how responsive Noordyk is when we are having issues with one of our machines—they have great technicians & customer service. Having Insight Application in place takes some of the work off my plate, allowing me more time for other tasks. We recommend Noordyk Business Equipment to several other businesses - I just love that Noordyk’s is a local family owned company! We previously were stressed with paying way too much for terrible service, but now that we are with Noordyk’s we couldn’t be happier. The price is good, the employees are very helpful and the service is tremendous. It’s a great feeling to know that we are working with honest people who will take care of us while providing us with quality service and products. Everyone at Noordyk Business Equipment is very friendly. We receive quick responses from every department. They are easy to contact and quick to help when we need it! We worked with Noordyk to upgrade all the printers in our office. We had some difficulties in our transition but Ben (or account rep) and the Noordyk support team were great to work with and helped us troubleshoot several major issues along the way. From network connectivity to saved documents on our old printers (also from Noordyke). By the end we were able to get everything back up and running. They really worked with us to make sure we were ultimately happy in the end and didn’t leave us having to deal with all of it on our own after the installations. Great company and great customer service. Noordyk Business Equipment has been able to alleviate many of the aches & pains we experienced with our previous office equipment vendor. When we have trouble with our machine we are able to easily communicate our needs to Noordyk’s - and their response time is impeccable! Even if we have problems on a Friday, Noordyk’s will still address the problem right away. It’s great to do business locally with a company that has existed in our community for many years. Noordyk Business Equipment has been very attentive to our office equipment needs. They walked us through the process of changing machines, making it a simple process. Both our sales representative & service technician were present for the delivery of our new machine to ensure it went smoothly. We love the desire for excellence in the customer service & people at Noordyk. We have always had Noordyk Business Equipment as our go-to experts for copy/printing machines and supplies. Noordyk has always been quick to assess and attend to our needs, repairs, and upgrades. They set the bar for prompt responses to any type of need. From the boss down to every employee, concerns are always taken seriously and we are greeted with a smile. They go the extra mile to please their customers. Employees are knowledgeable in all areas, including technology. Thank you for the excellent and quick service! We are in awe of how hard NBE works to keep our machines running and we truly appreciate your Service Department! Noordyk Business Equipment has served our copy, print and scan needs for over three years and they continue to provide amazing service. They helped us identify the right equipment for our office and have worked with us as our needs have grown to ensure that we have the equipment we need while consistently exceeding our expectations! When I hear the name “Noordyk” I know it’s a name I can trust. They work with a number of other churches, so I know our needs as a church are going to be met and that we are going to be taken care of. Ben has been wonderful to work with. He touches base with us frequently to insure that any questions we may have are answered, something we didn’t experience with our previous supplier. Our account is set up to automatically order supplies when needed and automatically send in our monthly meter readings saving Kris much valued time. The high quality of our Konica Minolta bizhub C654e allows us to do much more in house printing than we planned for. We couldn’t be more pleased with our experience with Noordyk!